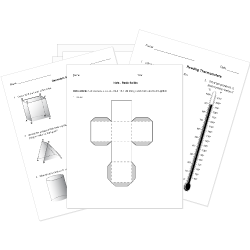 You can create printable tests and worksheets from these Grade 3 Area questions! Select one or more questions using the checkboxes above each question. Then click the add selected questions to a test button before moving to another page. A rectangle has one side of 3 and another of 7. What is the area? A swimming pool is 8 meters wide and 9 meters long. What is the area of the pool in square meters? Find the area in unit squares. Which shape is divided into the same number of equal parts as the rectangle shown? What is the area of the figure in unit squares? Which THREE figures each have an area of 12-square units? Select the THREE correct answers. What fraction shows the area of the shape that is shaded? What is the area in unit squares? Which equation can be used to calculate the area (A) of a rectangle that is 5 feet wide and 7 feet long? Which has a larger area than the figure shown? Which figure has an area of 16 square units? Which figure has an area of 12 square units? Parker makes the pattern shown with square tiles. He wants to rearrange his tiles and create two patterns so that he has no tiles left over. Which two patterns could Parker make? Gabe draws a rectangle that is 5 units wide and 10 units long. What is the area of a rectangle that has a length of 7 feet and a width of 4 feet? Each part of the circle equals what fraction of the area of the whole circle? Robert needs to determine the area of his garden. The garden is 12 feet long and 9 feet wide. Which statement explains how Robert can correctly calculate the area of his garden? Find the sum of 12 and 9. Multiply 1 by 2, multiply 1 by 9, and find the sum of the products. Multiply 1 by 9, multiply 2 by 9, and find the sum of the products. Multiply 10 by 9, multiply 2 by 9, and find the sum of the products. Which has an area that is the same as the area of the figure? Sam is setting up 3 tables for a bake sale. If each table has a length of 2 meters and a width of 2 meters, what is the total area of all three tables?